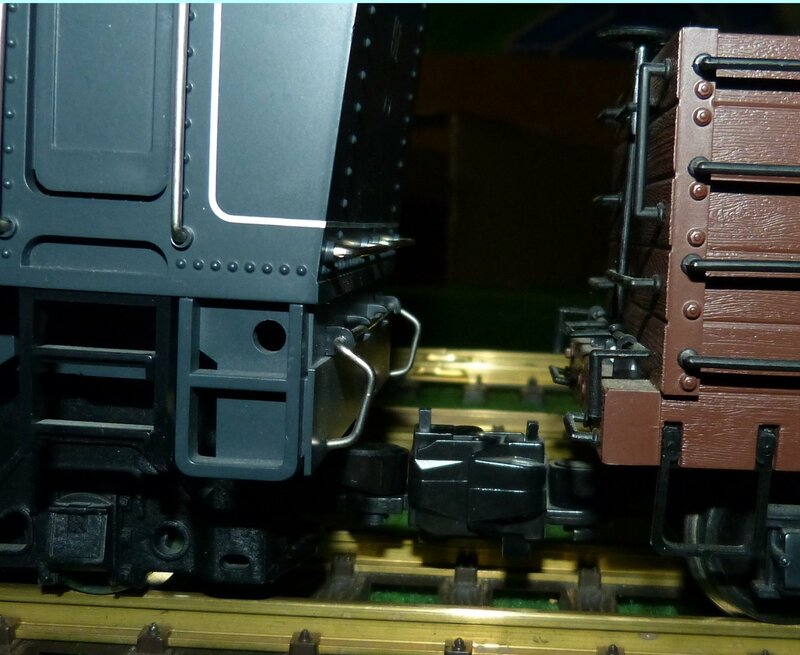 I little bit late , but I finally solved the coupler issue by installing a Bachmann couplers similar to those installed on all my Bachmann rolling stock. By hazard I discovered that there was an interference between the coupler vertical rod and a pneumatic hose. So I sadly removed the hose and now everything fine. I have a new question about lubrication . Is there a trick to put conductive oil in the more than small place between the wheel and the truck body ? If somebody can help me ? Best to use the LGB 50019 Special Oil for the location as illustrated. It comes in a sort of Syringe which can direct a tiny drop of the Lubricant to the bearing. Also put some in the Middle Wheel. If you get an irritating Squeek it is likely the Pickup Plungers. A spot of LGB Smoke Fluid used to clean the back of the wheels where they rub should clear this. They do not need to be Lubricated with any Conductive Oil in this location. ARIA31 - I own one of these super nice locomotives but I've upgraded the electrics with an LGB 55027 DCC power decoder and a Phoenix PB11 sound unit. And since this loco's circuit board and sound unit is DC/Analog technology only, there's no option to program any CVs as available on a DCC decoder, so that's not an option with the factory-installed electronics. 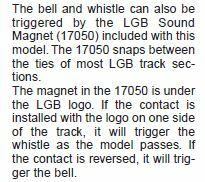 Did you receive the LGB Owners Instructions pamphlet with your loco.......it explains how to activate the brake sounds: "Triggering the "squealing" brake sounds requires a skilled hand on the speed control. The triggering requirements have been set narrowly to prevent inappropriate activation. The loco must be operating with a speed control setting over 1.5. Then turn the speed control slowly back to 0 to active the brake sounds. How slowly? The turn from 2 to 1 on the speed should take about two seconds (Fig7). All of this is much easier for owners of LGB's Jumbo power pack which features an automatic deceleration control. For example, if you set the deceleration control to 1 and activate automatic deceleration, the brake sounds will be triggered also. 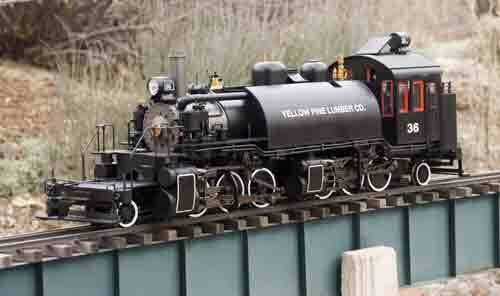 With the Jumbo there are many possibilities for automatically controlling the sounds of this loco. The brake sounds can be turned off using a DIP switch (see illustration). The DIP switches are under the cover over the volume control knob. So also make sure the DIP switch for the brake sounds, #2, is set to on. 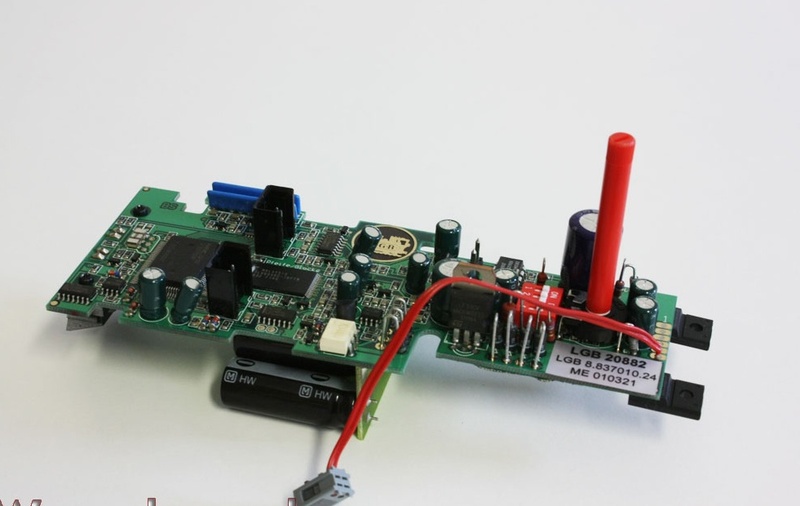 You'll also need to operate the loco at medium speed for a few minutes to recharge the internal capacitors that act like a rechargeable battery. If the loco has not been operated for a long time. If all these actions don't get your brake sounds to work, it's possible that element of the sound unit is defective. I wouldn't replace the electronics in your loco with a new DC/DCC decoder that can operate on either DC or DCC power just to get the brake sounds to work. Disassmbly and reassembly of one of the LGB Uintah locos is a real tedious pain! Many thanks Tom for your interest in my braking noise issue ! I have the LGB leaflet downloaded from Champex Linden web site. I noticed that the loco starts to run without noise at 6 Volts and then the sound system is activated only above a supply voltage of 10 volts (approx) . I operate mostly with 16 volts , on cruise speed. Then when slowing down, the noise is on while the loco is still running even at low speed. Finally when stopped all the nices noises (pumps, coal shovel) can be heard. I totally share your recommendation about upgrading to DCC. I am not skillful enough. And I am happy with her, how she runs currently. The loco must be operating with a speed control setting over 1.5. Probably refers to the LGB power supplies such as the LGB 5007 which has numbers on the voltage dial, e.g., 1 - 4, probably the same on the LGB Jumbo unit. I'd suggest you try an initial fast movement of the voltage dial say from 2 - 1 to activate the brake squeal, and then when brake sound starts you move the dial back a little to resume a normal loco slow down with the gradual dialing down to a stop position. That's what I recall I'd do with the LGB analog sound units. Four years ago I changed my layouts and locos to DCC except for three locos I haven't upgraded to DCC yet. For example, I have a USA Trains Je1 Hudson Steamer tinplate loco still DC power with a Phoenix sound unit, and the brake sound is very pronounced after highballing some. It occurs to me that perhaps the capacitor, for standing sounds, is not properly charging. I dont know what triggers braking sound, (ie which component or circuit/sensor) other than a reduction in speed (or increased drag or load at about the same voltage level as braking would otherwise occur. Eg. On curves and grades, ive been crawling and the brakes will spontaneously sound). Perhaps an electronic guru will know. While many of my older sound locos require a charge up, ie running for a few minutes, tops, to fully recharge the capacitor, after sitting for several days, or more, they all will provide sound at low voltage (1-2 volts,) start up for diesels, brake pumps and hiss for steamers. If you have yet to experience braking sounds, purposely or inadvertantly, im wondering if this might be the issue? Frankly, i dont know. Of those steamers i have with braking, they all still work. But components will wear out or fail. Fwiw, i get braking with a jumbo, a 10 amp bridgewerks, a 6v lgb with speed controller, and even a starter .5 pack. It is my experience that momementun, gradual accel decel features, can confuse the sound board. Perhaps tooeven a change in voltage? If i use this, often diesels wont provide starting sound, but stay silent and then jump to idleing. Done manually, this doesnt happen, fwiw. I also find, once fully charged, and after running, that if one allows the standing sounds to empty the capacitor, therer is a “reset” of the sound cycle, ie some sounds, such as shoveling or whistle will appear, when they might not during the initial charge up. Thank you Steve for these additionnal remarks. I have another thing that you might help me to understand . Here is what is written on the LGB 20882 leaflet. Does this means the magnet 17050 is already on my loco ? Or it was supposed to be in the box as an accessory ? I just have to buy the 17050 to enable this function on some places? I have the "Tender with Sound" 69572 and it has the same instructions. I bought the magnets and yes dependant on which way you run the tender over the magnet, whistle or bell, I assume yours will work the same. Thank you Jimmy I place today the 17050 order to ModellbahnLippe. two should have been included. they are often omitted by second hand sellers, im my experience. Notice the embossed "LGB" on the 17050 magnet top. under the "LGB" is a small magnet. it is only on one side of the small plastic 17050 "box". almost any small magnet placed between the rails may do the same. Thank you Steve and Jimmy. 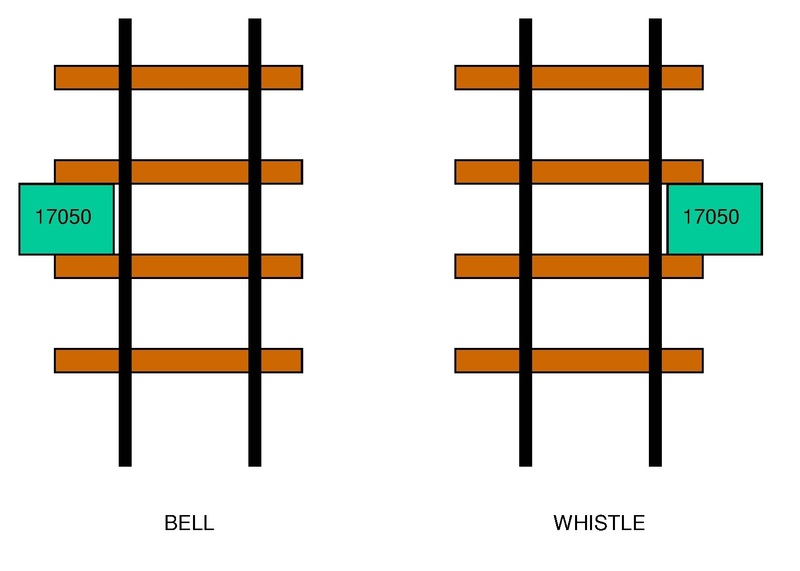 is it right understanding to intall the 17050 like on this drawing to get a whistle or Bell sound . it goes between the rails.. The reeds are in the motor-block, so sit between the tracks.. As stated, the magnet is under the embossed 'LGB' logo, so is easy to see which way round it is. I now have a couple of these bad boys and a Sumpter mallet. 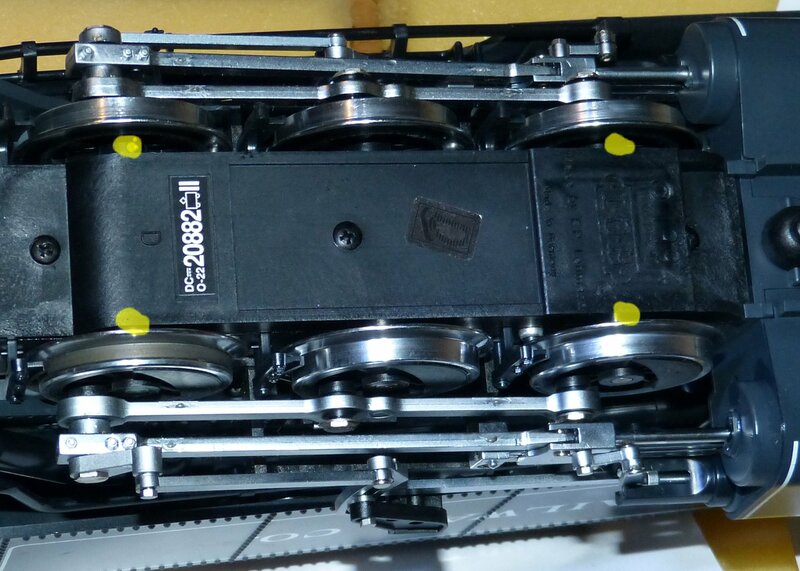 One of the Uintahs is brand new old stock ( pre Marklin model) and has not touched the rails besides testing. They are great locos that plug away forever provided that they are looked after. In fact I used some spare LGB Unitah/Sumpter sound boards in my DCC-ed Bachmann 'Annies' and they work fine on DCC power. The capacitor bank needs to be charged for all sounds to be available. Its has quite a capacity so needs about thirty seconds running to charge. The charge will last for about 30 seconds (when loco comes to a halt) before shutting the engine sounds down. Careful use of the throttle deceleration brings on the brake squeal. I have atrocious inclines on my layout so I have used two axles with both wheels having traction tyres, one axle in each motor block. There is no problem with power pickup as there are still two pick-up axles left in each motor block. Adding DCC to the Sumpter mallet is easy but it depends on how old the Uintah model is, as the early ones take a little more effort besides getting the loco apart!